From the collection Just After Sunset. Scott Staley is plagued by ghosts. Not your average, run of the mill, horror story ghosts, but the ghosts of objects, the possessions of the dead. The attacks on 9/11 killed everyone in his office at the World Trade Center; Scott alone survived because he played hooky that day. And now, relicts from his dead coworkers are appearing in his apartment. They carry a weight, a power, that is intended for Scott alone. I have the collar from my first dog, Bear. He died over ten years ago, but that collar still holds the same emotional weight that it did when he wore it. I have a connection to it; seeing it and touching it sparks a series of emotional memories that I had forgotten. I was in high school when the WTC was attacked. I wish I could say that I watched them with horror, but it was more of a confusion – I was unable to process what was going on. Afterwards, everything changed. It’s funny, because the generation beneath mine has no recollection of pre – 9/11 America. But my generation does. We remember the hope we had for the country that we were going to inherit. And then, within three hours, the entire scope of our country changed, was uprooted. That’s not to say that there’s no hope for our future, because there is. I believe in America, I believe in this country and its people. I believe that we’ve come out stronger, harder and closer to one another after that day of horror. But the attacks left a hole that will be felt for a long time. That’s what The Things They Left Behind is all about. This is not a horror story; it’s the aftermath of one. I had the opportunity to help out Electric Tweed shoot Django Django’s studio session for KEXP 90.3 last month. It was an awesome experience, to travel to NYC for a day; literally a “shoot and run” scenario. Django Django dropped by KEXP’s studio in Manhattan during the US leg of their tour for a quick studio session and interview. We rolled into the studio, set up as quick as we could and shot three songs and the interview with the UK musicians. Everything was shot on DSLR’s; a 5DM3, my 7D and a 60D. I always love the atmosphere of a recording studio. The creative energy is palpable; everyone there is excited to be there and driven to create a fantastic product. It’s an easy place to excel creatively no matter what you’re doing, as I think this video showcases. Lauren Slusher was also on hand to shoot stills of the session. You can check them out here. DJANGO MASTER1115-HD 1080p from ELECTRIC TWEED Productions on Vimeo. For more about Django Django. For more about Electric Tweed. Photography is a funny thing. I don’t really identify myself as a photographer. It’s a hobby of mine, I hardly ever do it professionally, and I don’t see any real future in it. Yet, somehow, I keep doing it. More and more each month. I was asked by a fellow filmmaker recently why I’m not going to sell my DSLR and buy a Black Magic Cinema camera or a C100. It took me a long time to figure out why. I love DSLR’s, I love the body style and the portability. But I identify myself as a filmmaker, which means I should probably have a filmmaker’s camera, not a mutant hybrid of photography and videography. So why do I refuse to let go of my DSLR? For me, shooting stills has always been a byproduct of shooting video. Photography is almost exactly like cinematography, only way easier. Movies tell stories, and use an extended time to do it, maybe one minute, maybe ninety. But in photography, you tell the story in one frame. That’s it. There’s no beginning – middle – end, there is just now. Just the moment. It’s funny to me, because it should be harder. I’ve told stories in two hours, it seems like telling them in one frame should be a challenge. Honestly, it probably is, but I don’t see it that way. To me, it’s just fun. There’s an assumption that artists love what they do. People think that every day we write or shoot or paint that we’re doing it with a smile and just having a great time. This is, almost completely wrong. I don’t love filmmaking. Seriously, I don’t. I spend equal amounts of time enjoying it, dreading it, hating it and procrastinating around it. I don’t do it because I love it; I do it because NOT doing it is the worst feeling in the world. Not shooting is like maliciously kicking a puppy; it’s the worst kind of self – disappointment you can imagine. I’m a filmmaker because I can’t not be one. For better or for worse, that’s the reason I do what I do; because there really isn’t another option. I’d spend all my time cursing myself for not doing what I “love”. Having spent the past eight years ridiculously devoted to filmmaking, I’ve come to identify myself as a “filmmaker”. While the definition of this word has become rather fluid in the past two years, it still means basically the same thing: shoot and edit video to tell a story. That story might be a narrative, a music video or a wedding, but the format is still the same. When I left my full time job, it became an even stronger passion. Now, because I was shooting for money, I had to work even harder and become an even better filmmaker. I had to devote myself to the craft and live as if there was nothing else that mattered. I think that, because filmmaking is my business and my livelihood at this stage, I can’t truly enjoy it. It’s who I am, what I do and a large portion of my identity. By creating this stigma, I’ve distanced myself from the reason I got started as a filmmaker in the first place – because I enjoyed it. The thing about photography is that I don’t have to do it, the way I have to make movies. It uses the same skill set and the same tools, but I don’t hate myself for not shooting because I’m not a photographer. Seriously, I’m not. I just really, really enjoy it. Like a lot. I’m allowed to enjoy photography because it’s not my identity. It’s just something I do on the side, for myself and for fun. So the question is; if I start identifying myself as a photographer…will it stop being fun too? I don’t know if I want to find out. All the images are of actress Andrea Lynn Green. Find out more about her here. Recently, my assistant editor has become more involved in my post production workflow. 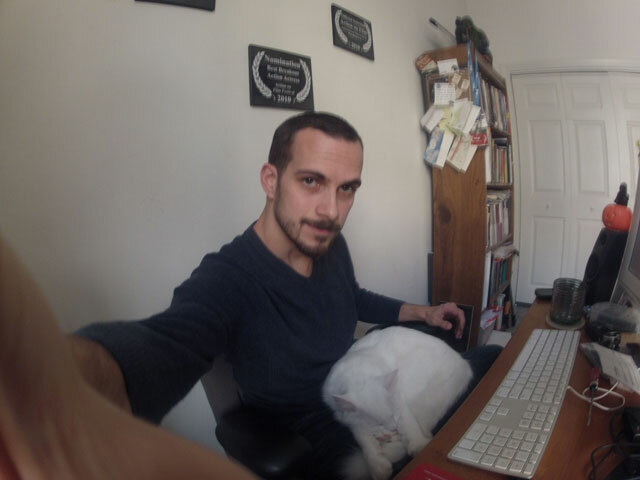 Firecracker, who functions as Post Production Intern and Sitting Boss decided that he wanted to contribute to my edit last week by walking on the keyboard during a coffee break. He inserted a clip all by himself, fearlessly exerting his creativity. That was when I realized I should probably start versioning my projects. What the Heck is Versioning? For anyone who doesn’t know, “versioning” refers to creating multiple backup versions of a project, in this case an edit. These versions are made at various intervals throughout the creation of the project and allow an editor to revert to a previous version of the project with ease, instead of undoing hours of work. Microsoft Word, Google Docs and Final Draft already have this functionality built in, calling it “Revision Mode.” These programs are expecting multiple writers to work on a single document, revising simultaneously. In the post production world, most of us will duplicate the project we’re working on before delivering it to the client for approval. It’s the peace of mind of knowing that you can go back to the original delivery if necessary. In addition, I version my projects before moving from post production to visual effects and color grading. I also have Time Machine automatically version my project files, so I can snag the prior version of a sequence if I need it. This involves recovering a file from an external application, but works in a pinch. Long story short, you can’t be too careful with versioning. There’s a new trend, at least in Apple applications, to remove the task of saving from the user. Programs have started autosaving every few minutes to ensure no changes will be lost if the program quits. Prior to this advent, you had to manually save whenever you made a change you wanted to keep. This meant saving frequently, but it gave the editor an odd kind of creativity in post production. You could make broad, sweeping changes without saving and, if they don’t work or are shot down, simply revert to the prior saved state. Autosaving can be a boon or a curse. While it’s great that I no longer have to worry about hitting Command+S every ten seconds, it creates a new problem. There’s no way to go back in time and undo what I’ve done, except by using the Undo command over and over. All this talk of undoing and reverting might make it sound like editors make mistakes frequently, which is not correct. You have to understand that editors working on large projects are dealing with input and changes from their bosses, who are in turn dealing with input from their clients. You could have as many as ten different people contributing to a single project file in one way or another. To have an application that can’t go back in time and doesn’t allow manual versioning is a serious problem. After discussing Firecracker’s artistic integrity, I realized I had to undo what he unknowingly did. Most applications (not just post production) have the option to “Revert” to a saved version in the File menu, which would have been an obvious choice. I could have simply returned to the previous saved state, before Firecracker had the chance to alter the cut. However, FCPX does not. This strikes me as remarkably strange. I’m not going to turn this into a “bash FCPX” post, but it’s a feature that’s sorely lacking. If a post production application removes the editors ability to manually version his project through selective saving, it should include some failsafes to guard against unwanted feline editing input. In all seriousness, I’m very disappointed that this feature is missing. Currently, I’m writing this blog post in WordPress, which versions my work every few minutes automatically. If I want to revert to a saved state, I simply need to choose the appropriate version from the list at the bottom of the page. It’s all laid out in front of me in an easy, comprehensible list. Remarkably like Apple’s Time Machine. Here’s what we need; not just for FCPX but for any post production application. Go ahead and allow autosaving. Do it every five minutes as you want. But make sure every autosave creates a new timestamped file. There’s no reason these files would be over 1 or 2mb in size – it’s essentially auto – duplicating a project file. But, also include a “Revision Mode“. This would allow you access to these versions from within the application. Just like Time Machine, you enter the revision mode and are able to revert to any saved state of your project. Client wants the version you delivered a week ago instead? Boom, it’s two clicks away. This technology already exists, it just needs to be implemented. Heck, you could even implement a “cloud” version that backs up to a cloud server instead of your internal HD. This would allow you to access your project file, including all its versions, from anywhere. Developers, I’m looking at you. Make this a reality and I’ll love you forever. I’ll even give you a beta tester. He’s fluffy and he already knows how to perform overwrite edits. In general, I try not to talk about camera news here. It’s not because it doesn’t interest me, it’s just because I can’t keep up to date enough to contribute any better than some of the other blogs out there. So, instead of discussing Sony’s new announcement and Red’s price drops, I’d like to take a moment to talk about the camera market as a whole, how it has changed in the last three years and why these changes occurred. It’s a testament to the power of customer satisfaction and the Invisible Hand. While this is a byproduct of technological advancement, it’s also a testament to the power of the market. When 5DMII’s and 7D’s started to sell to filmmakers, other camera companies sat up and took notice. It sparked an Invisible Hand competition between the camera companies to see who could better tailor their cameras to fit the needs of their customer base. It would be foolhardy to assume that we alone created a world of affordable 4K, but we can’t ignore the impact our influence had on the market. It’s evidenced in the firmware updates that emerged for DSLR’s – 24p, audio meters and the like were all developed to satisfy customer needs. The entire Magic Lantern firmware, developed to make these cameras filmmaking workhorses, was inspired by customer dissatisfaction – a hole in the market. Seeing DSLR’s being used as true film cameras, other companies began to develop new cameras and modify existing designs based on the needs of the filmmaking customer. Red scrapped their original Scarlet design to fit the new needs of the market, while Black Magic leapt forward by introducing their own camera. 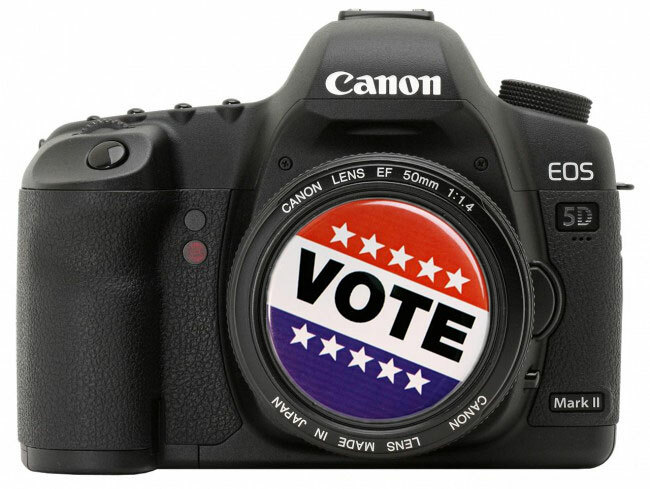 Our voice had been heard – we wanted affordable, high resolution film cameras with large sensors and interchangeable lenses. Manufacturers said yes. I can’t even begin to describe how thrilled I am to see these camera companies, large and small, listening and responding to our requests; indirect as it may be. Our community drove this change, using our economic power to tell the market exactly what we wanted. I want to see this continue. Let’s get out, let’s get shooting and let’s use our customer power to influence creation and innovation. If we had sat back three years ago and let the 5DMII pass us by, this change would not have happened. It’s not dissimilar to voting, is it? So let me shamelessly add this: I won’t judge you based on who you voted for, but I will judge you based on if you voted. So let’s get out there and exert some influence.